Inhalers are commonly prescribed for asthma. Chinese herbs are safe to take along with the inhaler to improve your condition. By Dongfeng Zhou, AP, DOM – Allergic Asthma is the most common form of asthma. 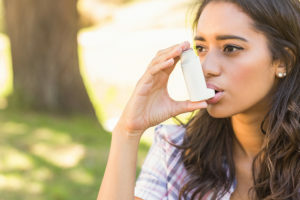 Allergic asthma is an immune hyper- reaction triggered by allergens such as pollen, dust mites, causes the narrowing of airways passages in the lungs due to inflammation. This results in coughing, wheezing, chest tightness, and shortness of breath. There are approximately 24 million people in the US who have asthma. About 60% (6 out of 10) of people with asthma have allergic asthma. For school-age children, this number is closer to 80%. Causes of allergic asthma include pollution in the environment, and weakened immunity in individuals. Statistic shows that allergic asthma is more common in industrialized countries than agricultural countries, and children are more prone to it than adults. In conventional medicine, there are many types of asthma medications. Some medications reduce airway inflammation while others relax the muscles around the airways to help relieve constriction. Common treatments include rescue inhalers, steroids, long-acting bronchodilators, anti-leukotriene drugs and antibody treatments. Asthma is classified, in Traditional Chinese Medicine (TCM), as wheezing and panting syndromes. It was first described in the ancient medical book Yellow Emperor’s Canon of Internal Medicine (Huang Di Nei Jing) over a thousand years ago: “when Yin is contending inside and Yang is disturbing outside, Yin and Yang will be out of balance. When Yang is not dense outside, the sweat gland will be wide open, and continuous sweating will occur. When Yin is out of order inside, the Yin essence will be out let and cause coldness of the extremities. When the heat of Yang hurts the lung, it will cause dyspnea and bronchial asthma.” Another classical book, Treatise on the Causes and Symptoms of Disease (610 AD), also pointed out other asthma characteristics such as its “regular recurrence” in individuals. Traditional Chinese Medicine has treated asthma successfully for a long time, and modern TCM practitioners have furthered their approach based on modern research and discoveries about immunology and allergy. 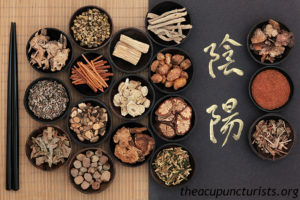 In addition to continuing to treating each patient based on their particular syndromes, practitioners often also include herbs that have been validated by biochemical lab studies to effectively treat allergic response such as blackberry lily rhizome (she gan), reishi mushroom (ling zhi), Manchurian wild ginger (xi xin), and ephedra (ma huang). In fact, a 2005 study published in the Journal of Allergy and Clinical Immunology caused quite a stir when it showed that a combination of reishi mushroom (Ling zhi), ephedra (ma huang), bitter apricot seed (xing ren), and licorice root (gan cao) can achieve the same control over asthma symptoms as inhaled corticosteroids. Stage two: fortify the function of the lungs, spleen and kidneys to further strengthen immunity with tonic herbs, thus gradually lessening and even eliminating the hyper-sensitivity of immune responses to allergens. In contrast to conventional medicine, patients treated with herbs will be able get off medications faster rather than depend on inhalers long-term. Cold type asthma 冷哮证 – Clinical manifestation: wheezing, shortness of breath, shallow breathing, chest tightness, white/clear/bobbling phlegm that is difficult to expectorate, no thirst, desire for warmth, worse in cold weather, dim complexion, pale tongue with white coating. Representative herbal formulas are She Gan Ma Huang Tang射干麻黄汤 and Xiao Qing Long Tang小青龙汤. – Ma Huang (ephedra), one of the key herbs in the formulas, has a B-adrenergic agonistic action which relaxes bronchial muscles to produce an effective anti-asthmatic action. Also, ma huang extract demonstrates an inhibiting activity on the classical complement pathway of all species, including human, pig, guinea pig. Thus, this herb can be used therapeutically for inflammatory diseases. Heat type asthma 热哮证 – Clinical manifestation: wheezing with heavy breathing, gurgling phlegm, raised chest with difficulty breathing, choking sensation with coughing fits, yellow sticky sputum, bitter taste, craving for cold drinks, red complexion and body heat, red tongue with yellow coating. Representative herbal formulas are定喘汤 Ding Chuan Tang and越婢加半夏汤 Yue Bi Jia Ban Xia Tang. The flower of Kuan Dong Hua (tussilago fafara), contains faradiol, rutin, hyperin, taraxanthin, and tannin which are effective antitussive, expectorant, and anti-asthmatic agents; it was used to treat chronic bronchitis, tuberculosis, and upper respiratory infections. Xing ren (apricot seed), contains the enzyme amygdalase, which can stimulate the respiratory center reflexively and produce a kind of tranquilizing effect; it is clinically proven to be antitussive and anti-asthmatic. At this stage, asthma attacks are less severe, and patients often feel drained and depleted. Immune function and response is controlled by three main organs in TCM: the lungs, spleen, and kidneys. In the strengthening stage of treatment, herbal formulas are used to strengthen one or more of these organs in order to regulate the immune response, in TCM terms, “boosting the lung and spleen qi”. Lung and spleen qi deficiency 肺脾气虚证 – Clinical manifestation: slight asthma cough, low voice and shortness of breath, diluted, clear phlegm, spontaneous sweating, aversion to wind, easily catch cold, fatigue, poor appetite. Tongue is pale with thin white coat. Representative herbal formulas are Liu Jun Zi Tang六君子汤and Bu Zhong Yi Qi Tang补中益气汤. – Astragalus (huang qi) is the key herb in these formulas, now well known in the holistic world due to its anti-rhinoviral activity; it is an important herb to prevent common cold and influenza. Lung and kidney qi deficiency 肺肾两虚证 – Clinical manifestation: shortness of breath, exertion even with slight movement, difficulty inhaling, vertigo, and tinnitus, weak lower back, palpitations, aversion to cold, and a pale complexion. The tongue is pale with a white coating. A combined formula with Sheng Mai San 生脉散 and Du Wei Sheng Qi Wan 都味肾气丸 are used to treat these conditions. Ren shen (ginseng) is a well-known qi tonic herb that has an immune-regulating effect. Studies show that ginsenoside in ginseng extract can stimulate the production of specific antibodies in animals, increasing the natural killer cell activity, and strengthen heart and lung functions. Dong Chong Xia Cao (cordyceps sinensis), another important herb, has an anti-asthmatic effect by causing smooth muscles to relax and can also potentiate epinephrine as well as increasing monocyte phagocytosis and antagonizing the anti-immunity effect induced by injection of cortisol in mice. Codyceps sinensis is considered one of the major herbs to nourish the lungs and kidneys and reinforce qi. It’s important to note that asthma could be life-threatening if inhalers are stopped spontaneously. Chinese herbs work well alongside conventional medicine. As herbal treatments start the healing process, patients may naturally need less of their corticosteroids. Advise your doctor of your improvements to see if she or he can help you to wean off the medications. Together with herbal medicine, dietary change is crucial in one’s healing. Cold and mucus-producing foods such as dairy should be avoided. Stress management through acupuncture, exercise, and psychotherapy can reduce the frequency of asthma attacks. Herbal medicines are generally safe and effective, but always consult with a licensed acupuncturist and herbalist to get the right herbs for you. Dr. Dongfeng Zhou is a skilled acupuncturist and herbalist practicing at our wellness center serving Margate, Coral Springs and Coconut Creek Florida. Schedule a free consultation with her today. Learn more about Chinese herbal medicine. “AAFA.” Allergic Asthma | AAFA.org, Allergy and Asthma Foundation of America, Sept. 2015, www.aafa.org/page/allergic-asthma.aspx. “Asthma: Treatment.” Asthma : Treatment / West and East Medicine, Integrated Chinese Medicine Holdings Limited, 2005, www.shen-nong.com/eng/health/asthma_treatment.html. Huang, K. C., and W. Michael Williams. 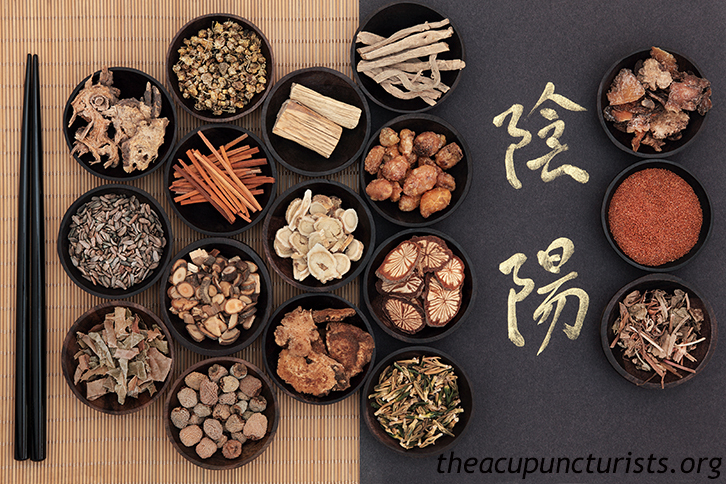 The Pharmacology of Chinese Herbs. CRC Press, 1999. Stanescu, Adina. “Traditional Chinese Medicine for Allergic Asthma and Cough.” Vitality Magazine, 1 Oct. 2013, vitalitymagazine.com/article/traditional-chinese-medicine-for-allergic-asthma-and-cough/. “Treatment Options for Allergy-Triggered Asthma.” WebMD, WebMD, www.webmd.com/asthma/allergic-asthma-treatments#1.